Apple on Monday revealed iOS 8 is now running on 77 percent of iPhones and iPads registered with the App Store, up five percent from early February. Last year's iOS 7 accounts for another 20 percent, while earlier versions make up the remaining 3 percent. 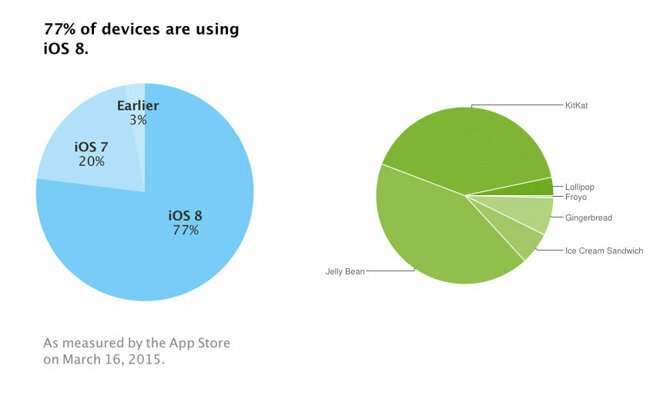 Apple's numbers are in stark comparison to Google's Android operating system. According to Google's developer webpage, 2013's Android 4.4 KitKat accounts for 40.9 percent of installs, while versions 4.1.x, 4.2.x and 4.3 Jelly Bean combine to take up another 42.6 percent. Distribution of Android's latest 5.0 Lollipop, released in 2014 and most recently updated this month, stands at only 3.3 percent. Judging by this week's statistics, Apple's iOS 8 is steadily gaining ground after a brief period of stagnation in early October following the botched iOS 8.0.1 update that disabled cellular connectivity and Touch ID on then-new iPhone 6 and 6 Plus handsets. Most recently, Apple released iOS 8.2 on the same day as its "Spring Forward" event earlier this month, adding a new Apple Watch app for managing the upcoming wearable device. The update also addressed an SSL/TSL flaw dubbed"FREAK."